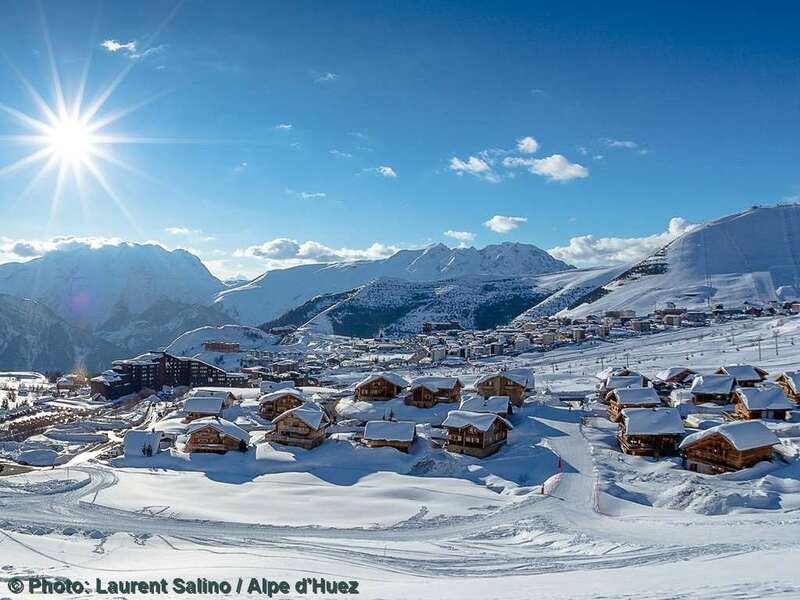 Also known as l’Isle au Soleil thanks to an average of 300 days’ sunshine per year, Alpe d’Huez perches on a south-facing plateau high above the clouds with incredible far-reaching views. Skiers of all levels are catered for, from the good selection of gentle runs for beginners all the way up to La Sarenne, the legendary 16km black run. The resort has a fantastic selection of non-skiing activities on offer, from ice driving to ice skating on the Olympic-sized ice rink; dog-sledding to paragliding. The ice cave at the top of the DMC gondola must not be missed, every year the sculptures change. In the resort itself there is a good selection of bars and restaurants as well as shops, two cinemas, an indoor pool and a climbing wall. With 249km of pistes, 4 snow-parks, a half-pipe and boardercross – as well as 50km of cross-country trails – Alpe d’Huez caters to all levels. Boarders may come across a few flat areas on the pistes but the freeriding more than makes up for this. Experts have a selection of black runs to add to the off-piste offerings and heli-skiing; as well as the famous La Sarenne, four itinerary runs and the Tunnel are a great way for experienced skiers to test their ability. Intermediates have a great choice of everything from long blues to challenging reds; Beginners have two fantastic networks of gentle green runs just above the village. Non-skiers can explore 35km of winter walking trails, some of which link up with mountain restaurants meaning everyone can meet up for lunch. This wealth of amenities is the reason why families, groups and non-skiers choose ski holidays in Alpe d’Huez. Après-ski in Alpe d'Huez is quite lively with a good number of bars spread across the resort. La Folie Douce has changed the face of après-ski at every resort it has graced like Val Thorens and Méribel. This will be no different and will become a major focus of the après-ski loving British market. In town we recommend Smithy's and for late night partying we recommend the Igloo Club (of course). Alpe d’Huez skiing is perfect for beginners, wide gentle slopes running underneath the DMC Gondola (which are often protected for beginners only), and the local ski schools have an unrivalled reputation in giving novices the best possible start. Ski holidays in Alpe d’Huez are particularly good for intermediates with a wide ranging choice of blues and reds, with particularly interesting trips down to Vaujany, Oz en Oisans and Auris en Oisans. 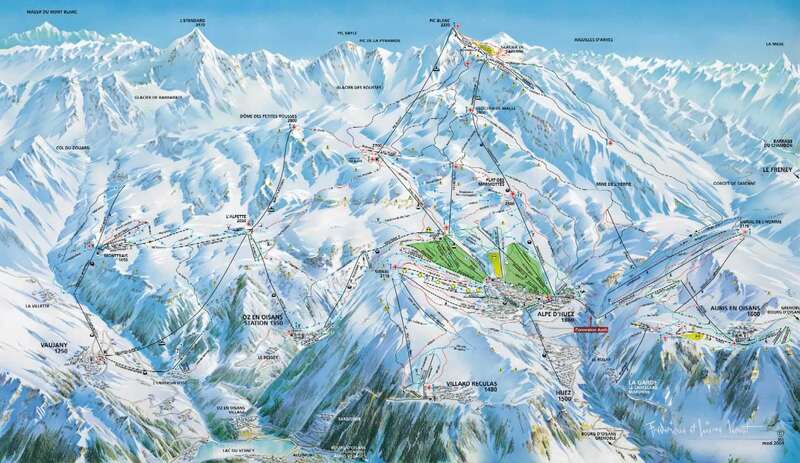 The lift system is one of the best in the Alps, with queues rarely a problem, except some weekends. One of the longest black runs in Europe, La Sarenne, is particularly challenging with The infamous Tunnel run providing advanced skiers with plenty to enjoy on their ski holidays in Alpe d’Huez. Undoubtedly ski holidays in Alpe d’Huez provide a great choice for groups of skiers of mixed ability with the large range of varied pistes on offer. The high altitude resort is blessed with large amounts of natural snow and with the help of snow making facilities on most of it's pistes snow coverage can be guaranteed throughout the season. Alpe d'Huez is a beautiful and comforting village which is great for family ski holidays. As well as many great ski schools there are lots of activities to keep the whole family entertained through the week. There is tobogganing, ice skating, swimming, skidooing and much more that the kids will love, as well as a brilliant variety of bars and restaurants for adults. Auberge de la Combe Haute - the perfect stop to relax after skiing down the Sarenne piste. Chantebise 2100 - Large south facing sun terrace with plenty of deckchairs for soaking up the sun on your lunch break. Nuvo Self Restaurant - Cheap and cheerful self service restaurant near Folie Douce. Sphere - A small bar in the centre popular with seasonaires. La Folie Douce - Perfect spot on the mountain with one straight run back to resort. Underground Bar - A popular London themed bar with live music most evenings. O'Sharkey's Bar - An Irish sports bar. Iglu Ski has a fantastic range of Alpe d'huez ski chalets available throughout the season. Choose from luxury through to budget chalets in Alpe d'Huez and enjoy the ultimate ski holiday experience. We also offer excellent Alpe d'huez ski apartments which are superbly located whether you prefer a quiet luxury spot or being right in the centre of all the action. Simply browse our huge list of Alpe d'Huez apartments to find the place that's perfect for you. The resort is also home to plenty of top class Alpe d'Huez hotels which range from budget rooms for short breaks to large group ski hotels perfect for larger parties. Whatever your needs on the slopes, our Alpe d'Huez hotels will meet your expectations in every way. The closest international airports are Grenoble (GNB), Geneva (GVA), Lyon Bron (LYN) which are all within a one to two and a half hours drive from Alp d'Huez ski resort. Fantastic large resort with options for everyone depending on their ability. Great apres ski.